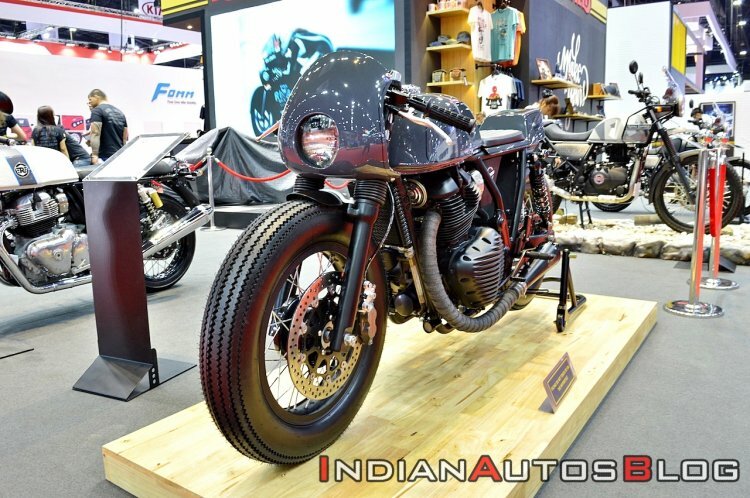 Royal Enfield is displaying a custom model based on the Continental GT 650 called 'Vayu' at the 2019 Bangkok International Motor Show. Here are its live images from the show. The custom Royal Enfield Continental GT 650 Vayu features a fairing, custom body panels and bigger tyres that give it a beefier look. It has an aftermarket exhaust and a better braking setup as well. Christened as the Vayu, the custom Royal Enfield Continental GT gets new body panels and bigger tyres that give the motorcycle a beefier look. The fascia retains the round headlight design although the illuminator is accompanied by a bikini fairing that enhances its retro looks. The cockpit has received changes in the form of lower handlebars for sportier ergonomics. The handlebar also benefits from old-school grips and aftermarket switchgear. The fuel tank retains the shape from the standard model, and the top continues to feature a chrome filler cap. The stripes and new logo design give the motorcycle a refreshed look. The custom saddle follows the fuel tank while at the rear is an angular cowl. The seat gets contrasting stitching with a ribbed pattern. The tail section features an aftermarket tail light in a round shape. The rear blinkers are mounted on top of the suspension. 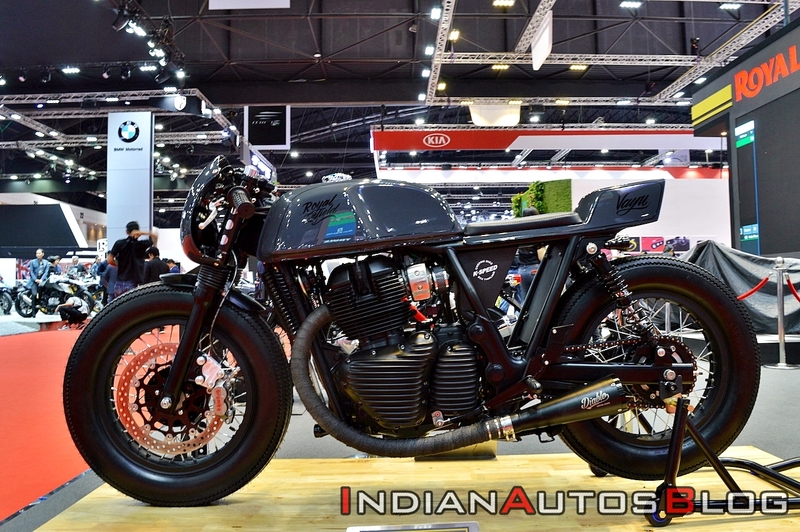 The lack of rear fender gives the Vayu a compact and clean look. The sides reveal the K-Speed Custom’s branding along with Diablo aftermarket exhausts. As on the standard motorcycle, the exhaust system on the custom model features twin outlets. The engine gets meatier covers with a horizontal line pattern. In the stock state of tune, this 648 cc parallel-twin, air-cooled engine develops 47 bhp at 7,250 rpm and 52 Nm of torque at 5,250 rpm. Hardware specifications have been retained from the standard Royal Enfield Continental GT 650, and the custom motorcycle rides on conventional telescopic forks at the front and twin-sided springs at the rear. The front forks also get a pair of gaiters to protect the oil seals. The bigger tyres have reduced the suspension travel although the exact numbers are not available. The braking setup has received an upgrade, too, and while the custom motorcycle retains the single discs on both wheels, the stopping power comes from Brembo callipers instead of ByBre from the standard bike. The Royal Enfield Continental GT 650 Vayu gets sportier ergonomics with lower handlebar and repositioned footrests. The various modifications enhance the retro character of the standard Continental GT 650. The Royal Enfield Continental GT 650 Vayu enhances the retro looks of the standard cafe racer, and it looks appealing.